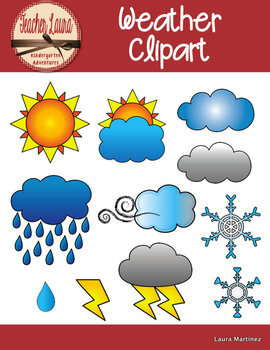 This is a set of clipart images showing various types of weather. This is a .zip file. Before purchasing please make sure your computer can unzip .zip files and has the software needed to open these types of files. Each image is a .png file. That means it has an image without a white box surrounding it in the background. The black outline is close to the color and images are easily layered on documents. To use the images, just open the file - click on an image and drag and drop it into your document. Images come in both color AND black and white. See the preview to see all images included. 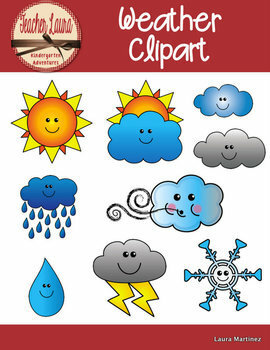 The weather images come in 2 styles - with smiley faces and without smiley faces. 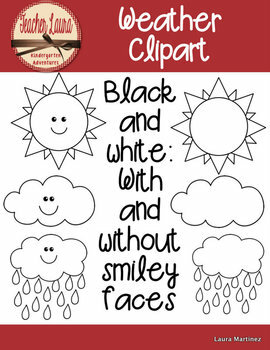 Clipart is for both personal or commercial use with a link back to my TPT store in your credits page for products you sell. See preview of contents before purchasing (the preview does not show all of the black and white images, but they are all in a similar style to those shown.